"We were beaten with a tree branch or kicked around. Some kidnappers threatened us with death at gunpoint to force us to follow them in chanting their Islamic prayer for conversion," said Jae Chang-hee. 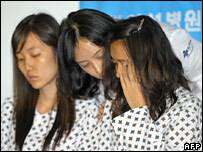 South Korea's intelligence chief has refused to deny that his government paid a ransom to obtain the group's release.